As you can see, I'm a fringe fiend, pairing my gold fringe necklace with my super light and airy fringed poncho–sans camisole. 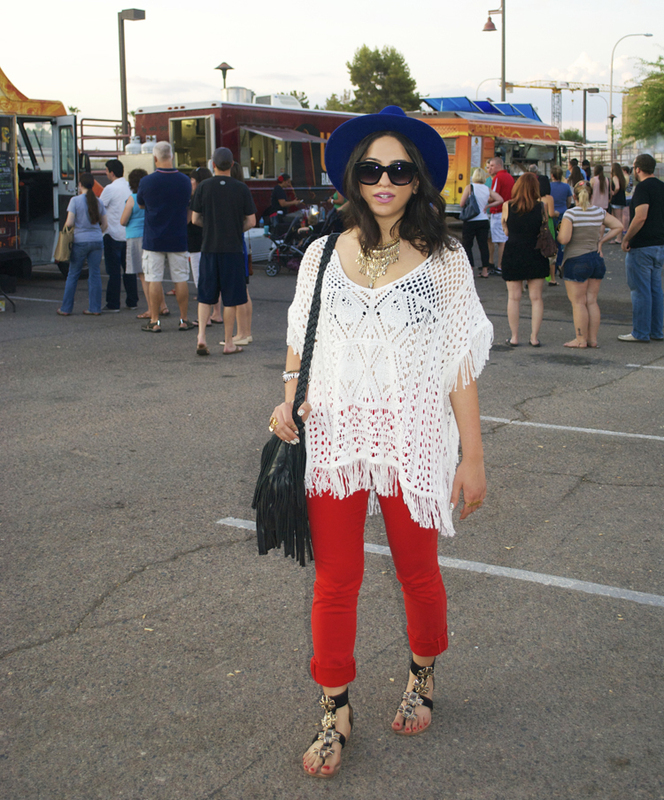 I skipped the cowgirl boots and stuck with jeweled gladiator sandals to go with my red-hot, high-waisted ankle jeans. And I threw on my blue wide-brimmed hat and my fringed leather messenger bag to complete the look. 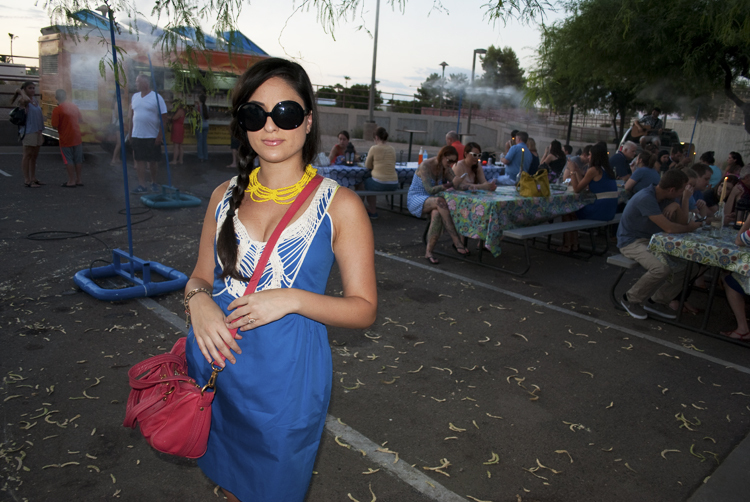 Pascale is cowgirl-chic in her bold blue dress and red cross-body. 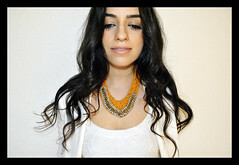 Her multi-strand yellow necklace mimics the lasso-like embellishment of her dress. You can never go wrong with a good pair of cowgirl boots and a loose braid... And some all black shades for a touch of glam. Giddy up y'all. 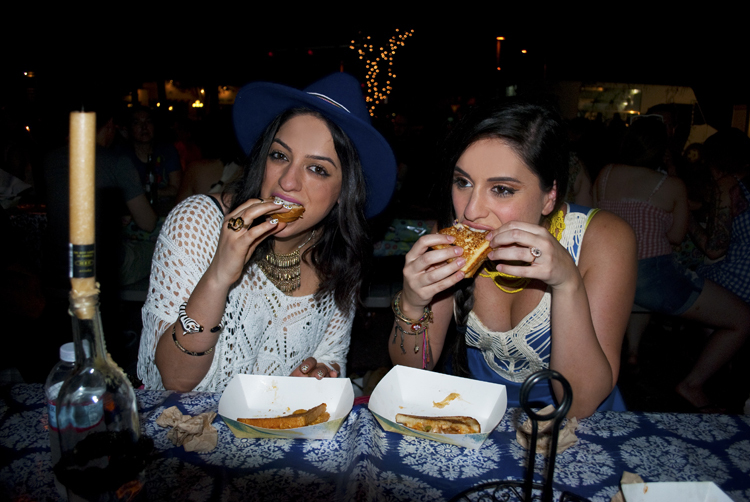 The food truck caravan is like a little oasis of joy and deliciousness that appears in a mirage-like fashion on the desert streets of Old Town Scottsdale every Saturday night. From the Grilled Cheese Truck, where we scarfed down a Cheesy Mac & Rib (macaroni and cheese with sharp cheddar, BBQ pork, caramelized onions) and a Buffalo Chicken Melt (habanero jack and crumbled bleu cheese, spicy roasted buffalo chicken and celery coleslaw)... to the SuperFarm Food Truck where we scored some artisan ice cream in flavors like Mint Chocolate Chip, Nutella and S'more... who would even notice the 106 degree temps (at night, mind you). The soft country tunes floating from the awesome guitar-strumming dude on the back of his truck paired with the soft glow of string-lit trees and taper candles in wine bottles didn't help when it came time to leave this blissful bubble. But at least we got our food truck fix... until next weekend! !